Look at your courses and think about how a creative assignment or visualization might help in the understanding of a concept, event, place, etc. Think about times during the course when many students had a difficult time understanding or staying engaged with the content and may have benefited from hands-on work or a change of scenery. Do a library database search to find articles about different ways 3D printing & other makerspace tools have been integrated into your discipline. Do a web search to find content about different ways 3D printing & other makerspace tools have been integrated into your discipline. Contact your friendly makerspace coordinators. We have tons of ideas and are happy to chat about them! It’s even available as an image, if you’d prefer! We know assignment design is a complex process, but we hope these tips can at least make it a little easier for faculty of all academic disciplines to provide high-tech, hands-on coursework for their students. This entry was posted in Anthropology, Art, Art History, Assignments, Biology, chemistry, Computer Science, Innovation & Entrepreneurship, Math, Museum Studies and tagged academic library makerspace, assignment design on November 18, 2018 by Angela Vanden Elzen. When I was a junior, I decided that I’d work on autonomous vehicles after graduation. However, as an undergraduate, I’d not be able to produce a research paper in the field. 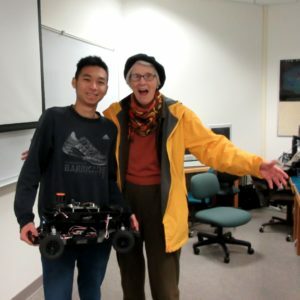 Thus, I dedicated my senior experience to building a self-driving RC car, which was within my reach. Calling it self-driving might be a stretch, since the only capability for the car was wall-following. However, the project really took me a lot of time and energy. The first step was to build a platform where the electronics could stand. There were a lot of electronics that needed to be on the RC car, and they couldn’t just be taped on the top. Thus, I paid someone to use a laser cutter to cut out different parts of the platform from two pieces of plastics. After assembly, the electronics could safely be placed on top of the RC car. The Makerspace doesn’t have a laser cutter, but Angela purchased one on back order, so we’ll see when we will get it! The second step was to put the electronics securely on the platform. That process requires a lot of screws, standoffs and even fasteners! In addition, I had to solder a lot of circuits and headers in the Makerspace. There are many useful communal tools in the Makerspace, such as a soldering iron, screw drivers and various types of glue! On top of that, Angela, who is in charge of the Makerspace, is also helpful and wiling to buy almost whatever tools you want! She also has great ears to listen to your complaints when things go south! The final step was software. I used ROS on Ubuntu to analyze the data from the Lidar, and to send commands from the computer to the micro-controller. The computer uses the Lidar data to estimate the distance between the car and the wall. If the car is too far away from the desired distance, the computer tells the micro-controller to steer closer, and vice versa. How much should the car steer? Well, that is handled by a PID controller, which takes the off-set from the desired distance and outputs the steering angle. In total, the project took me about half a year. I took a class on Arduino in the chemistry department in the spring term of my junior year (yes, chemistry!) and worked on the project through the following summer and fall. During the entire process, I spent quite some time in the Makerspace, complaining to Angela! When the project was finished, I gave a talk about it, and many people came, including Angela! Look at how much she aged after listening to all my complaints! This entry was posted in Assignments, chemistry, Computer Science, Student post and tagged Computer Science, self-driving car on June 20, 2018 by Wenchao Liu. 3D printed smartphone microscopy housings and magnifying glass beads. How did microscopy become a thing? A very brief history of microscopy. The first microscope is largely credited to having been created by a Dutch man named Antonie Von Leeuwenhoek, during the 17th century (Howard Hughes Medical Institute). 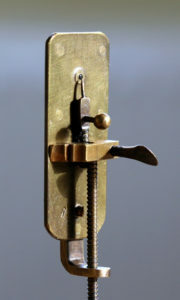 Leeuwenhoek utilized a relatively simple apparatus to discover and explore what he called, “animalcules.” His apparatus consisted primarily of a very precisely shaped glass bead, embedded into a handheld housing. Using this instrument, he explored many different mediums (e.g. pond water, blood) and discovered many different microbes (e.g. Daphnia, bacteria, red blood cells). As time continued, more methods of microscopy have been developed and advanced. In modernity, we have crafted various advanced optical/light microscopes capable of viewing samples at 300x magnification. Other methods exist that allow us to analyze samples outside wavelengths of light suited for the human eye (e.g. infrared, ultraviolet). Methods such as scanning electron microscopy and transmission electron microscopy manipulate electrons to obtain highly detailed images of greater magnifications. These methods can magnify samples anywhere between 1,000x-30,000x (depending on the particular method). Most life on earth is completely invisible to the human eye, without the aid of a microscope. Looking at the tree of life, one can see that most of it is microbial and that a small sliver/branch of it, actually constitutes what we can see. This vast, teeming, beautiful, and barely explored microcosm can often go overlooked every moment. Though these microbes may go overlooked, that by no means implies that they have little affect on the way our world is. In fact, these microbes have a profound effect. Bacteria cover everything including our own skin. They also live within many organisms (including ourselves) and help us in several ways. However, many microbes can make us extremely sick and with the current state of increasing global antibiotic resistance, it is crucial that we understand more about these organisms to maintain our own well-being. Different methods of 3D printed microscopy have been developed over the past decade, however, the focus of this project will primarily be with one particular method. This method was developed by Pacific Northwest National Laboratories (PNNL) and is very similar to Leeuwenhoek’s first microscope, in a lot of ways. 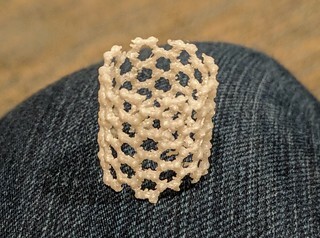 The method consists of 3D printing a housing that hold a glass bead of a specific diameter. The diameter of the spherical glass bead in turn determines the magnification that the microscope is capable of. This apparatus then slips over your smartphone camera and can be used to view certain things. The concept of 3D printed smartphone microscopy visualizes many benefits. 3D printed microscopy methods may be far more economically feasible than other microscopy methods. Many microscopes are not cheap, however, if a microscope could be composed primarily of one cheap material (e.g. 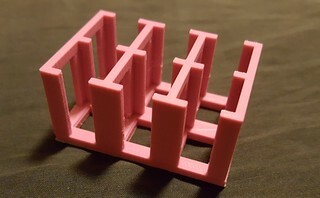 PLA, ABS) and printed quickly through additive manufacturing techniques, one might be able to print many cheap but efficient microscopes (hence maximizing productivity). Furthermore, these microscopes may be easier to use and deploy in resource poor areas. 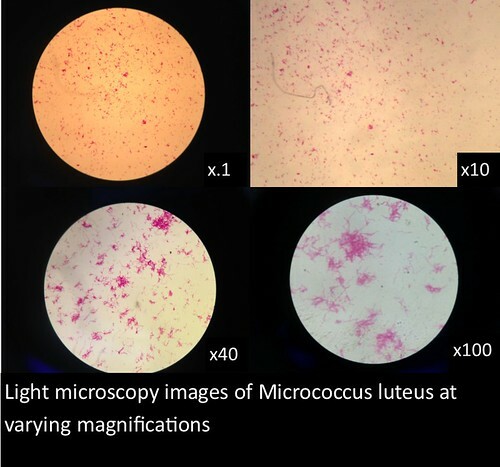 In this project, I used standardized slides with microorganisms of a known type to test the efficiency of PNNL’s smartphone microscope design against that of a standardized light microscope (a Nikon Eclipse E100). The slides consisted of Zea mays, Rhodospirilium rubrum, Bacillus megaterium, and Micrococcus luteus. Efficiency was determined primarily by comparing the magnification, resolution, durability/ease of use, and overall clarity of the smartphone microscopes with the light microscope. Two magnifications were tested with the smartphone microscope housings: 100x and 350x (with beads of 3.5 mm and 1.0 mm diameters respectively). Many beads provided by the equipment company were not perfectly spherical and had slight imperfections (e.g. small dents, cloudiness, smudges). In this project, the most spherical and clear beads were used and a 70% isopropyl alcohol solution was used to clean the beads before and after use to optimize image clarity. Latex gloves were also used to prevent finger oils and foreign contaminants that might be located on one’s hands from contacting the bead surface. .Stl files for the housings were obtained from PNNL’s website and the bead holes were expanded post printing, as they were initially too small. The images and figures below were obtained through analysis of the slides. 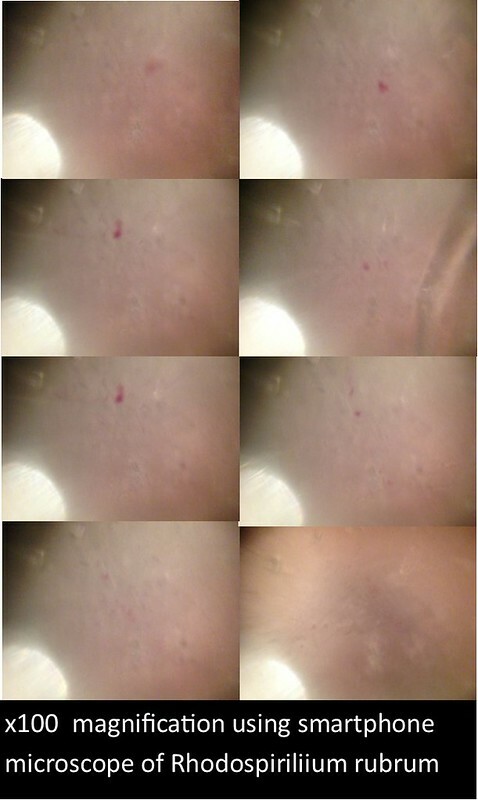 The smartphone microscope images generally appeared to be of considerably lower quality compared to the light microscope. 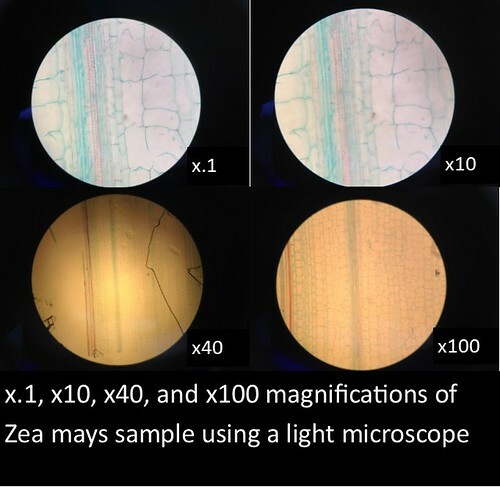 Images taken with the smartphone microscope often had poor resolution and clarity (so much so that the Zea mays sample was unobservable with the smartphone microscope). This in part might be attributed to imperfections and detritus on the bead surface. 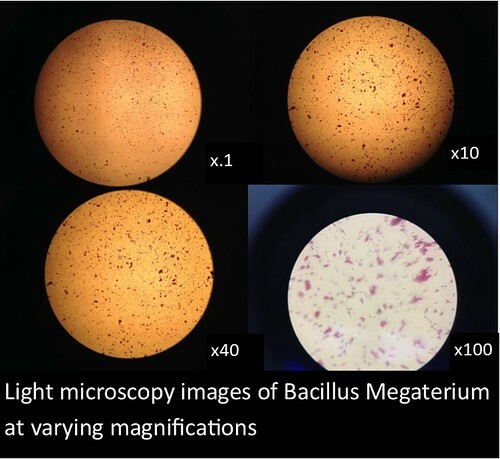 On the other hand, the smartphone microscopes were capable of magnifying fairly well, however, the poor resolution and higher sensitivity of these microscopes made it harder to view clear images and control the instrument. Lighting was also an influencing factor. At times, it was difficult to establish optimal lighting conditions for the smartphone microscope (in contrast to the light microscopes which have a fixed and adjustable light source). Often, imperfections or oil on the bead would lead to strange diffraction patterns of light that wouldn’t illuminate the sample very well. It also proved an arduous task to insert beads into the housing. At first, the housing files proved too small to house the beads. I ended up expanding the holes within the housings by about 0.3 mm for the x100 magnification and about .1 mm for the x350 magnification. I later created a .stl file with an assay of housings with different sized holes to find the optimal size for each magnification. It seems that this version of the smartphone microscope can still be promising for future smartphone microscopy endeavors. If one finds a way to address just a couple of key issues, this technology could be very efficient. Perhaps, if one found a way to maintain consistent beads with little to no imperfections, it likely would improve the resolution and clarity of the microscope. Also, if someone found a way to optimize the process of embedding the bead into the housing without contaminating, dropping, or losing the bead, that would also make a big difference. Adjusting the print files to house the beads without further adjustment would also improve the overall process. Recent advances in smartphone microscopy include a smartphone microscope apparatus created by the Centre for Nanoscale BioPhotonics: Arc Centre of Excellence, which is a 3D printed “clip on” that requires no bead whatsoever. 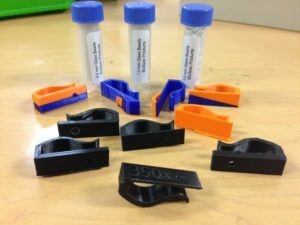 The entire apparatus is 3D printed (preferably with black filament) and utilizes ambient light and camera flash to illuminate and magnify samples. More information about how it works can be found here. This method appears to be promising as well. This project could not have been completed without the guidance of Angela Vanden Elzen. Additionally, crucial supplies were provided generously by Wayne and JoAnn of the Biology Stockroom. Thank you to Dr. Jodi Sedlock for allowing me to utilize her lab space. Special thanks also to Dr. Nancy Wall for providing the prepared slides and allowing me to use her lab space/microscope. Howard Hughes Medical Institute. Seeing The Invisible: Van Leeuwenhoek’s First Glimpses Of The Microbial World. 2014, https://www.youtube.com/watch?v=ePnbkNVdPio. Accessed 30 May 2018. “PNNL Smartphone Microscope – Available Technologies – PNNL”. Availabletechnologies.Pnnl.Gov, 2018, https://availabletechnologies.pnnl.gov/technology.asp?id=393. Accessed 30 May 2018. This entry was posted in 3D Printing, Assignments, Biology, chemistry, Student post and tagged 3D Printing, biochemistry on May 31, 2018 by Harsimran Kalsi. For the last 3 years, Professor Deanna Donohoue has included 3D printers with her instrumental analysis chemistry course. In addition to 3D printers, students use other innovative tools such as Arduinos. For the 3D printing portion, students receive training and access to the space and are instructed to print a chemistry-related object from the Journal of Chemical Education, the NIH 3D print exchange, or a general 3D object repository like Thingiverse. How can we use 3D printers with other instruments or instrument development? Draw a black box model of the 3D printer. Include the computer and steps involved on the computer. Find an application of 3D printing that you think is interesting. Find a scientific publication which uses an instrument made with a 3D printer, or has parts from a 3D printer. The students are encouraged to think of the printers as they would any other laboratory tool or equipment. This approach as a scientific instrument gives the students beneficial insight and understanding when it comes to troubleshooting. Professor Donohoue described these printers as exciting tools to allow for citizen science as well as creating inexpensive custom tools that allow for previously cost-prohibitive field work. 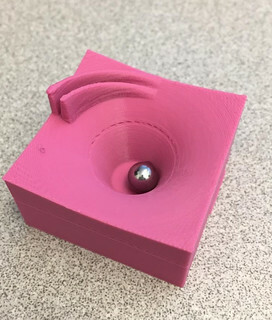 This entry was posted in 3D Printing, Assignments, chemistry and tagged 3D Printing, academic library makerspace, chemistry, instrumental analysis on February 26, 2018 by Angela Vanden Elzen.